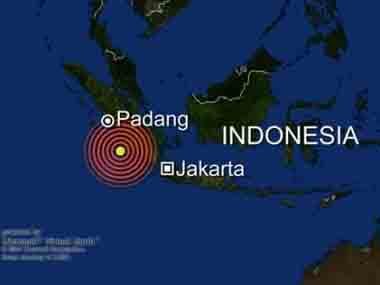 BR> A volcano tsunami happened without warning after Anak Krakatau's erupted caused by an undersea landslide. 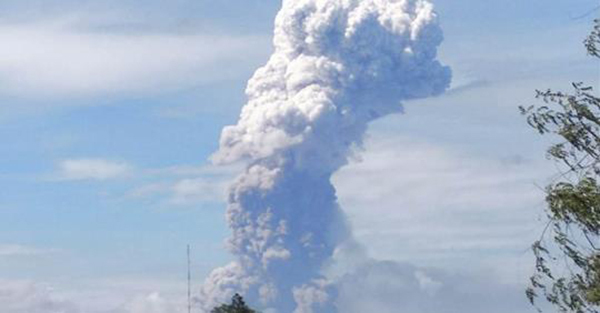 Lying on the Ring of Fire, Indonesia experiences a high frequency of earthquakes and is home to 127 active volcanoes. The catastrophic 2004 Indian Ocean 9.3 earthquake and tsunami happened around the same time of year, occurring on December 26 (Boxing Day), but causing more widespread damage throughout the rim of the Indian Ocean, with countries as far afield as Thailand and Sri Lanka being affected. If you have a cell phone, it probably buzzed and beeped loudly Wednesday afternoon October 3, 2018 around 2:18 p.m. ET. "Presidential Alert," the screen said. "THIS IS A TEST of the National Wireless Emergency Alert System. No action is needed." 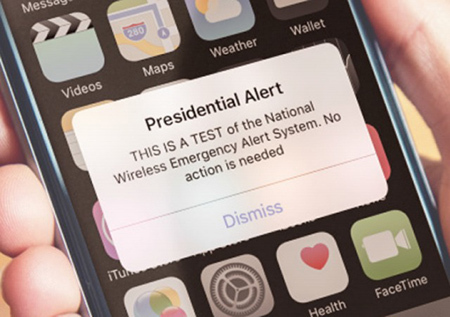 It' was the first nationwide test of the system built by the federal government and cell phone carriers to warn Americans of an emergency, like a terror attack or a widespread disaster. Did your cell phone go off? Mine did as I was talking to a friend in Florida. Her alert was about one minute behind mine. Some people got nothing. I also had a message on my TV. Many people are worried about this being a warning of things to come - be that an enemy attack or a natural disaster. One should always be prepared for anything in End Times. A massive landslide and tsunami that denuded the slopes of an Alaskan fjord could reveal warning signs that could help predict future disasters. In a new paper, researchers described the geological fingerprints of the tsunami, which tore through Taan Fjord on Oct.17, 2015, at an estimated 100 mph (162 km/h). Using satellite imagery and field-based measurements, the team discovered that the slope was displaying signs of instability for at least two decades before it failed. The "geologic evidence can help [us] understand past occurrences of similar events and might provide forewarning," the researchers wrote. A layer of ooze made of microscopic fossils may underlie Earth's biggest landslides, a new study finds. The biggest landslides on Earth are not on dry land but rather on the seafloor. For instance, the volcanic eruption of Mount St. Helens in 1980 triggered a collapse of about 0.7 cubic miles (3 cubic kilometers) of rock, but the Storegga "megaslide" offshore Norway about 8,150 years ago sent more than 1,000 times more material crashing downward, previous research found. Submarine landslides are not just perils for life underwater; they can trigger catastrophic tsunami that can wreak havoc on land. For example, prior work suggested that the Storegga megaslide triggered a tsunami that deluged surrounding coasts with waves up to 65 feet (20 meters) high. The 2011 Japanese tsunami set the stage for something unprecedented. For the first time in recorded history, scientists have detected entire communities of coastal species crossing the ocean by floating on makeshift rafts. Nearly 300 species have appeared on the shores of Hawaii and the U.S. West Coast attached to tsunami debris. On September 7, 2017, at 11:49 p.m. CDT, a magnitude 8.1 earthquake occurred off the coast of Chiapas, Mexico. At least 32 people have died. The earthquake also generated a tsunami with waves of 1 metre (3 ft 3 in) above tide level; tsunami alerts have been issued for surrounding areas. It was the strongest earthquake recorded in Mexico in a century as well as the second strongest recorded in the country's history, behind the magnitude 8.6 earthquake in 1787. It is also the most intense recorded globally in 2017. The earthquake caused some buildings in Mexico City to shake and several earthquake alarms in Mexico City were activated, prompting the evacuation of buildings. The incident prompted a review of the system. Vast underwater ruins from an ancient Roman city have been discovered off northeast Tunisia. The find confirms a theory that the city of Neapolis was partly submerged by a tsunami in the 4th century AD. It also verifies that Neapolis was once the largest centre in the Roman world for the production of garum, a fermented fish-based condiment that was a favorite of ancient Rome. Californians may be used to hearing about the threat of potentially deadly earthquakes, but a new study finds that quake-triggered tsunamis pose a greater risk to Southern California than previously thought. Tsunamis are monster waves that can reach more than 100 feet (30 meters) high. 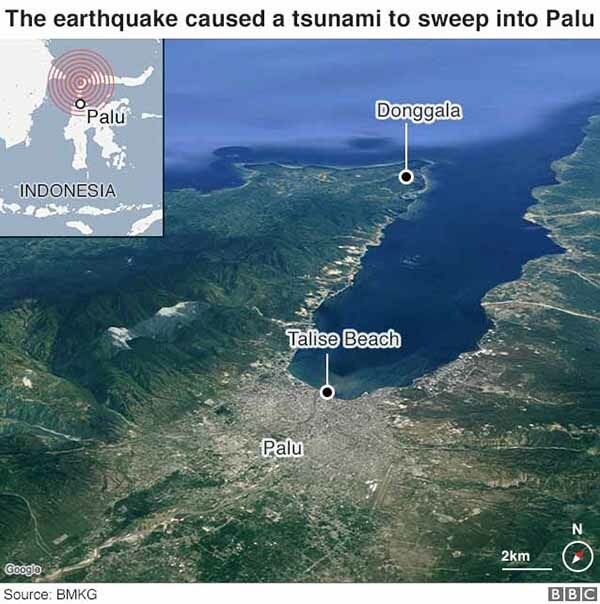 They are often caused by earthquakes; the 2004 Banda Aceh earthquake and tsunami killed about 250,000 people, while the 2011 Tohoku earthquake and tsunami that struck offshore of Japan killed about 20,000 people and triggered a nuclear disaster. Tsunamis increase in size as the depth of water in which they occur decreases. Since water depth is usually shallow near coastlines, tsunamis can grow as they approach land, becoming particularly dangerous along heavily populated coastlines, such as those in Southern California. Small offshore islands help protect beaches from storm waves, but they're no match for tsunamis. It turns out that small islands boost the power of big tsunami waves, rather than absorbing their impact, a new study shows. In a computer model, a small island amplified tsunami flooding directly behind it by up to 70 percent. The study shows that some areas that were supposed to be at low risk are at higher risk than anticipated. Tsunami waves in the ocean are generated by the sudden motion of the seafloor or by underwater landslides. The rapid movement is like a giant paddle stroke that creates a series of huge ripples that transform into terrifying waves closer to shore. The length between the top (or crest) of each wave can be as much as 100 miles (160 kilometers). A cave on the northwestern coast of Sumatra holds a remarkable record of big tsunamis in the Indian Ocean. The limestone opening, close to Banda Aceh, retains the sandy deposits washed ashore by huge, earthquake-induced waves over thousands of years. Scientists are using the site to help determine the frequency of catastrophes like the event of 26 December 2004. This is being done by dating the cave's tsunami-borne sediments, which are easy to see between layers of bat droppings. A small tsunami triggered by a quake has hit Japan's eastern coast - where the crippled Fukushima nuclear plant is located - but no damage is reported. The 30cm (1ft) waves reached the region after the 7.1 magnitude tremor struck at a depth of 10km (six miles), about 320km off the coast. A "tidal wave" violently tossed ships docked along the Delaware River south of Philadelphia at about 11 a.m. ET on Jan. 8, 1817, according to newspapers of the time. Turns out, that tidal wave was actually a tsunami, launched by a powerful magnitude-7.4 earthquake that struck at approximately 4:30 a.m. ET near the northern tip of the Bermuda Triangle, a new study finds. If melting ice caps trigger rapid sea level rise, the strain that the edges of continents could experience might set off underwater landslides, new research suggests. Submarine landslides happen on every continental margin, the underwater parts of continental plates bordering oceanic plates. These underwater avalanches, which can happen when underwater slopes get hit by earthquakes or otherwise have too much weight loaded onto them, can generate dangerous tsunamis. A staggering half of all the Earth moved by submarine landslides over the past 125,000 years apparently happened between 8,000 and 15,000 years ago. "This time period coincides with the period of most rapid sea level rise following the end of the last ice age," said study co-author Daniel Brothers, a geophysicist at the U.S. Geological Survey's Coastal and Marine Science Center in Woods Hole, Mass. A powerful 8.0 magnitude earthquake caused a tsunami that sent strong waves crashing into several South Pacific islands on Wednesday, with officials in the Solomon Islands saying that at least four people died. The earthquake prompted tsunami warnings and watches from several island chains to Australia and later New Zealand, but many were later canceled. The low-lying Solomon Islands, however, were not spared. At least 100 homes in the community of Lata were destroyed by a surge of water, according to World Vision, a Christian humanitarian organization. Water and electricity also remain down in the township, which is the capital of the Solomon Islands' Temoto Province. An ancient tsunami caused dramatic long-term ecological changes in the Caribbean more than 3,000 years ago, new research suggests. Scientists investigated sediments from a coastal lagoon on the Caribbean island of Bonaire about 50 miles (80 kilometers) north of the Venezuelan coast. The Caribbean is highly vulnerable to coastal hazards such as hurricanes, tsunamis, mudslides and floods. Bonaire has not experienced a tsunami during the past 500 years of its recorded history. However, analysis of the size of sediment grains found on the island, the organic matter present in the sediment (such as animal remains and carbonate minerals), as well as other factors suggest that a devastating wave struck the island about 3,000 to 3,300 years ago. One second you're volunteering to be your uncle's translator, and the next a glacial wave nearly sinks your ship. Jens Moller was visiting family near Ilulissat, Greenland, when he decided to go for a boat ride with his uncle to serve as a translator for an Australian tourist, and to have a look at the local glaciers. Moller, who's from Greenland but speaks fluent English, hopped aboard his uncle's 18-foot (5.5-meter) ship. Upon inspecting the glaciers at a place named Eqi, the group heard some cracking. Thinking that a small section of the glacier was about to fall into the water, Moller started filming with his video camera. A new study shows that a great earthquake and tsunami that killed 192 people in Samoa, American Samoa and northern Tonga on Sept. 29, 2009, actually was triple whammy. University of Utah seismologist Keith Koper says the main quake of magnitude 8.1 concealed and triggered two major quakes of magnitude 7.8 that occurred within two minutes of the main shock. Stars on map show epicenters of the three quakes. Dashed lines show boundaries between Earth's crustal plates, and arrows show plate motions. The 8.1 quake occurred when the Pacific plate cracked as it dived slowly westward beneath the Tonga block of the Australia plate, triggering the two 7.8 quakes on the boundary between the Pacific plate and Tonga block. Such a pattern never had been observed previously. Credit: Keith Koper, University of Utah Seismograph Stations. A strange double earthquake was responsible for the tsunami that devastated parts of the South Pacific in 2009, scientists claim. In a rare set of events, an initial 8.1 magnitude earthquake was immediately followed by a second 8.0 shock. The resulting tsunami devastated the South Pacific islands of Tonga and Samoa. An estimated 192 people died as four waves each more than five metres high surged inland. The giant earthquake in Chile that struck Friday - one of the most powerful ever recorded - killed more than 700 people and leveled cities. Yet the tsunamis spawned by the earthquake were smaller than expected, leaving experts speculating as to why. Tsunamis reached only 4 feet (1.2 meters) in Japan and 6.5 feet (2 meters) in the South Pacific island of Tonga, according to scientists. Tsunamis can often become monster waves of more than 100 feet (30.5 meters). Furthermore, despite a massive evacuation of Hawaii, tsunamis in Hawaii measured only about three feet (one meter), too small to do any damage. A persistent school of thought in recent years has held that so-called "chevrons," large U- or V-shaped formations found in some of the world's coastal areas, are evidence of megatsunamis caused by asteroids or comets slamming into the ocean. Using satellite images from the Google Earth software, Teeuw and his team surveyed Dominica, gaining a bird's-eye view of rock outcrops normally obscured by vegetation. They noticed that the north coast of the island is unusually straight, indicating active earthquake faults. Further investigations on the ground revealed large tension cracks along the flank of a volcano, Morne aux Diables (Devils' Peak)�convincing the team of the landslide threat (volcano facts). A huge wave crashed into the New York City region 2,300 years ago, dumping sediment and shells across Long Island and New Jersey and casting wood debris far up the Hudson River. The scenario, proposed by scientists, is undergoing further examination to verify radiocarbon dates and to rule out other causes of the upheaval. Sedimentary deposits from more than 20 cores in New York and New Jersey indicate that some sort of violent force swept the Northeast coastal region in 300BC. A meteorite impact off Long Island 2,300 years ago may have set off a huge tsunami that flooded the New York City region, a new study says . It's not known whether any ancient settlements were in the path of the proposed killer waves, but any significant tsunami today would be devastating and likely to flood places like lower Manhattan. Tsunamis like the the one that devastated ancient Alexandria in A.D. 365 may hit the Mediterranean relatively often, a new study argues. Scientists say they have pinpointed the geological fault - off the coast of the Greek island of Crete - that likely slipped during a huge quake and caused the ancient tsunami. The 2007 Solomon Islands earthquake took place on 2 April 2007, near the provincial capital of Gizo on Ghizo Island, in the Solomon Islands. 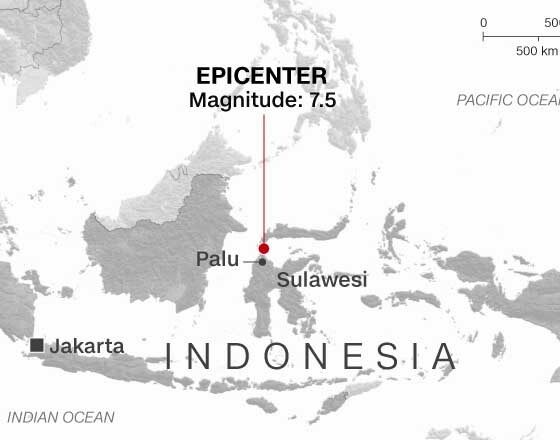 Its magnitude was calculated by the United States Geological Survey (USGS) as being at 8.1 on the moment magnitude scale. The tsunami that followed the earthquake killed 52 people. According to the USGS, the earthquake was recorded around 7:39:56 a.m. local time (UTC+11). The focus was 10 km (6 mi) deep and 40 km (25 mi) South South-East of Gizo township on New Georgia Islands in Western Province. There were numerous aftershocks, the largest of which had a magnitude of 6.2. The 1998 Papua New Guinea earthquake was a magnitude 7.0 earthquake that took place in the early evening of Friday, 17 July 1998. The earthquake struck the north coast region of Papua New Guinea, 25 km (16 mi) from the coast near Aitape, and caused a large undersea landslide, which in turn caused a tsunami that hit the coast, killing more than 2200 people. A village of low huts made of woven coconut palm leaves and sticks rises from a hill well behind the ruins of beachfront villages smashed by a huge and deadly wave. Survivors, battered, without possessions, many badly injured or dying, scrambled into the hills after the tsunami Friday that killed perhaps as many as 6,000 people in several coastal villages. The new, nameless village depends on emergency supplies of rice, flour and water delivered by air and on the meager pickings of a few vegetable gardens and whatever can be foraged from the forest. Unused fishing traps lie around the huts.